In contrast to the familiar way-over-time scheme of allocating position to the ordinate and time to the abscissa of a plane coordinate system, in special relativity is has become habitual to allocate abscissa to time, and ordinate to position (Minkowski Diagram). This kind of presentation is of special interest when objects move at a speed not small compared to the speed of light (c = 2.99 792 458 *108 m/s), measured relative to a resting observer at the origin of the system. Using ct instead of t for the ordinate, both axes get the same dimension of length. A trajectory (curve) in this scheme is called a wordline. For t < 0 it shows the entire past of the event, for t > 0 its future. Any point on the world line is called an event. To achieve reasonable scaling for fast objects 2.99 792 458 *108 m/s * (1 unit of time) is used as unit for the x axis. If time is measured in seconds the x- unit will be 2.99 792 458 *108 m ≈ 300 000 km = 1 lightsecond. With this scaling of space−time geometry a light signal passing the origin will appear as a straight line at 45 degrees to the axes (a light cone if one includes two spatial directions). The simulation will demonstrate the movement of a particle under constant acceleration at its worldline. Under the laws of classical mechanics there would be no limit to the speed that an object can achieve under constant acceleration, relative to an observer resting at its starting place. It would follow a parabola in space−time. Special relativity theory tells us that this is not possible. A real, accelerated object can approach the speed of light at most. As it approaches this range, from the standpoint of the resting observer its mass increases while the speed increment decreases. In the view of an observer moving with the object, speed continues to increase. The resting observer interprets this impression as caused by dilatation of the time scale in the moving object. The base of special relativity is the experimentally proven fact that light (a photon, which has no rest mass) travels with constant velocity c in any system. Its world line is a diagonal both for the resting and the moving observer. A consequence is that no observed object can travel faster than light. Therefore any events that have a causal connection lie above the light cone. The "classical" path becomes unreal when it reaches the gradient of the cone, independent of how great the acceleration would be. With Play an object (black: wheel classical, magenta point: relativistic) starts at the origin in x direction with constant acceleration b. Its "classical" worldline is shown in light gray. It would cross the red light cone at x = 2 and achieve speed of light at x = 1 (gradient equals that of the light cone). At the beginning classical and relativistic objects seem to coincide and to travel along the paraboloid classical worldline, while a red photon runs ahead on its light cone with the speed of light. When speed is no longer small compared to that of light, classical and relativistic worldlines separate. 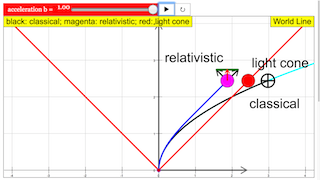 While the "classical", black wheel pursues the gray parabola, the real, magenta colored object draws its relativistic blue worldline (a hyperbola), which finally runs parallel to the light cone when the object is approaching the speed of light. The difference between "classical" and relativistic case becomes obvious only when the speed is of the order of magnitude of the speed of light. With t scaled in seconds (x = 1 corresponds to 300 000 km), all happenings in "normal life" will be restricted to the immediate neighborhood of the origin. Play/Pause starts and stops the animation. Reset leads back to the starting condition. Acceleration can be changed with the slider b. Default value is b = 1 which results in the classical object achieving the speed of light after 1 unit of ct at a distance of 1/2 unit of x km. After 2 ct units the object would surpass the simultaneously started photon. In scaling it is open which is the unit of time. If time is scaled in seconds, the unit of the x scale is light seconds; if it is scaled in years, it is light years. The real relativistic path (blue) is a hyperbola, which for small speed is not visibly discernible from the classical parabola. At high speed the hyperbola becomes nearly parallel to the light cone. The object can approach the speed of light, but not achieve it. E1: Start the simulation and check when relativistic effect become noticable. Try this for different accelerations. E2: Observe the light cone originating from the moving object. How will the observer at rest appraise light signals emitted forward or backward? E3: Reflect about the scaling of "earthly" happenings. Take as an example a rocket with constant acceleration of 10 times that of earthly gravitation g = 9,8 m/s2. How long will it take till relativistic effects become noticeable? How far away will the object be at that time? E5: The time resulting will not be extreme. What is the real limiting resource? Do some calculation! Adjusting the slider will toggle the acceleration. Notice how changing the acceleration will change the path of the object.